The Emissions Control System that Pays for Itself! 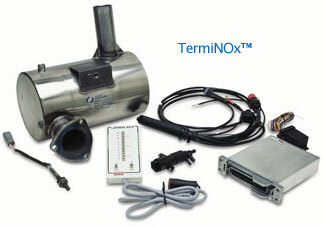 TermiNOx™converts any open-loop LPG or CNG fueled off-road engine into a state of the art, digitally programmable, closed-loop, 3-way controlled engine that simultaneously reduces CO, HC, and NOx emissions by an impressive and verified 85-90+%*. In addition, the fuel efficiency of the vehicle typically improves by as much as 20% - combine these savings and reduced building ventilation costs and the TermiNOx™ system can provide you a full return on investment in as little as one year.